The lives of these students were all changed through donors like you. Consider the legacy you can leave. Be a part of a brighter future by making a gift through a charitable bequest. Read more below to find out how. 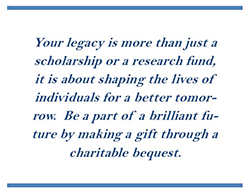 A bequest is one of the easiest forms of gifts that you can make to support the University and our students. Through your bequest, you have the opportunity to shape the lives of future generations but you also create a lasting legacy for yourself. What follows is sample language that you and your legal counsel may use to name the University as a beneficiary. Thank you for considering naming the University of California, Irvine as a beneficiary of your estate. The University continues to serve our community by providing world class education coupled with cutting-edge research. Through your gift, you create a lasting legacy in the lives of the students and individuals that you will be able to help. Once your estate documents are complete, we would love to have you become a member of the Campus' legacy society. You can inform us by contacting Roland Ho, Executive Director, Office of Planned Giving at 949.824.6454 or e-mail roland.ho@uci.edu. I give to the University of California, Irvine Foundation, (tax id # 95-2540117)located in Irvine, California (description of gift; i.e. percentage of estate, specific dollar amount etc.). This gift shall be used to benefit (description of program). Please feel free to contact us, we will be happy to assist you. Our direct number is 949-824-6454.